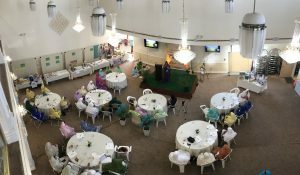 On March 17, 2019, women from the Dawoodi Bohra community of Orange County, California hosted an inaugural Women’s Conference and Expo. The purpose and goal of the conference was to empower women by providing tools, education, and awareness surrounding mind, body, and spiritual health. Over 50 women attended the conference and the event was telecast live across the country. There were presentations on a number of topics, including traditional eastern medicine, cancer prevention, entrepreneurship and yoga. Speakers included medical professionals and business leaders. Women entrepreneurs in the community had an opportunity to set up booths to share information about their businesses and inspire other young women to pursue entrepreneurship. During the conference, the organisers also launched a number of new programs and initiatives, including an online language learning course and resources for identifying halal products in the United States. This successful event, hosted by women for women, is expected to be the first in a series. The next event will offer free health consultations for all community members on eastern medicine practices that are generally not covered by medical insurance plans, such as ayurveda and acupuncture.